Are you looking for simple ways to embrace (and survive!) 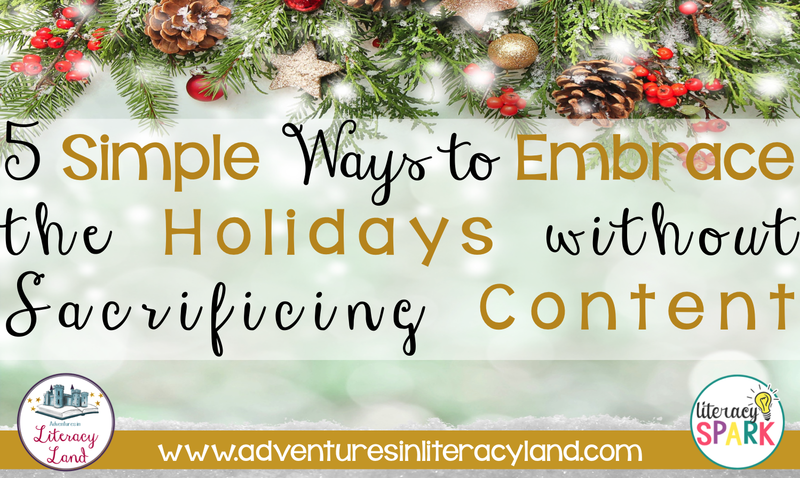 the holiday season without sacrificing the content you are responsible for teaching? My hand is raised! My students have fun each and every holiday season in my classroom, but I never stop teaching. You will not find my students and I watching the Grinch on a Friday afternoon...Read on to find out how you can incorporate the holidays so that your students still have fun, but continue to teach at the same time! Some of us are lucky enough to have an aide or paraprofessional ("para") in our classroom for one, or maybe many, periods throughout the day. This may be to meet the needs of special education students, ESL students, struggling readers, or just because. 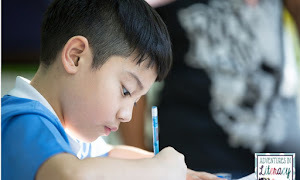 Sometimes these paras enter the classroom with specific tasks and other times they do not and it is up to the classroom teacher to provide them. Having been an ESL teacher, most of the positions I have held allowed for a para to be in my classroom for about 30-60 minutes per day. Of course if there were assessments occurring, staff absent, or anything special going on this did not occur. BUT, having an extra person for even just a small amount of time can be very useful! If you are a new teacher, you might walk into your new classroom and find the closets and cabinets full of literacy curriculum materials from the last twenty years (literally). And if you are an experienced teacher, you might be the one filling those closets! Or maybe you just inherited some piles when moving classrooms. Either way, we all know the sight of the hallway just full of books and workbooks lined up next to the doors waiting to be picked up by the janitorial staff. Have you ever thought about how you could repurpose SOME (not all!) of these materials? Here are a few suggestions. 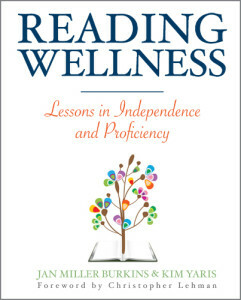 This is Jessica from Literacy Spark here today to share with you Chapter 4: Mindfulness from Reading Wellness by Jan Miller and Kim Yaris. 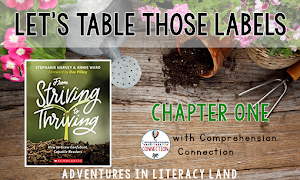 Be sure to check out all the posts from this week if you are just joining us (I posted about each chapter on my blog as well) and don't forget you can access the book online (currently for free!) from Stenhouse Publishers. 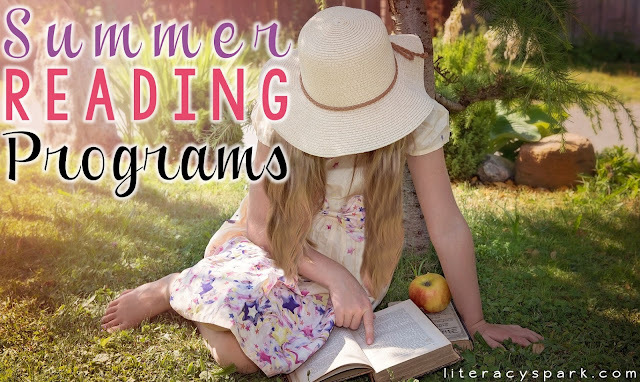 With summer vacation here for many and just around the corner for others, we hear a lot about summer reading and making sure kids read at home while not in school. But what about writing? Reading and writing go hand in hand. So, whether you are finishing up the school year or at home with your kids on summer vacation, don't forget to encourage them to write! Here are some simple, fun, and authentic ways to incorporate writing at home this summer (and all year round)! If you are a teacher, consider providing your students with your address or an email address so that they can write to you about their summer adventures. As a parent, encourage your kids to write letters to relatives whom they may not see as often or friends that have moved away. Or find them a pen pal...even if it's a kid just a street over, it would still be a blast for younger kids to write back and forth. It's also usually possible to find an address for celebrities your child may be interested in online...can't guarantee a response though! Post cards are so cheap to buy! Purchase them when you go out of town and have your children write about their experiences and send them to a friend or family member. Super easy and quick writing practice. The year is so hectic we often run out of time for handmade cards when school is in session. Have your kids get ahead by making birthday cards for relatives in advance. They could even make cards for upcoming holidays or decorate thank you cards to use in the future (just leave the inside blank). Have your kids write reviews about movies they see, books they read, restaurants they eat at, and places they visit throughout the summer. They can rate the places using stars and then describe why they gave the rating they did. You could even compare their ratings to those found online. Do your kids have friends over throughout the summer? Any family barbecues or birthday parties? Have your children make invitations for these events complete with the date, time, place, and events. Get some neat note pads and use them for lists. 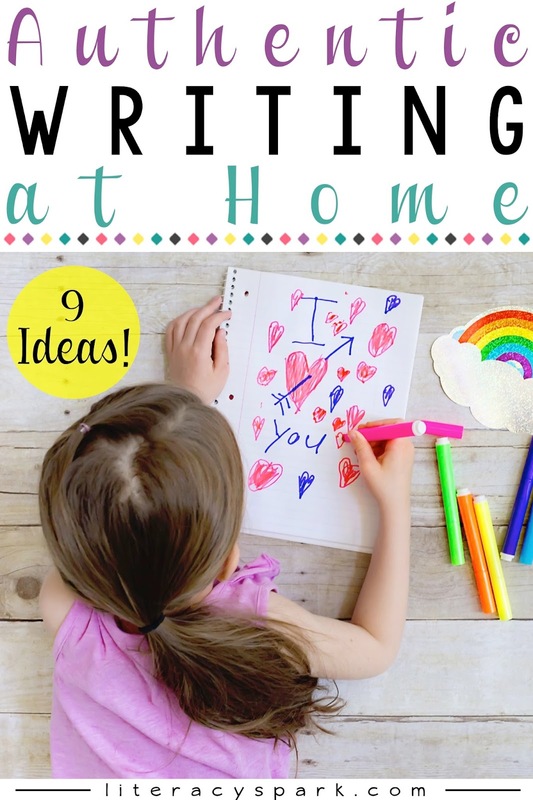 Your children can write lists of what they need at the grocery store, things they need to get done on a particular day, books they'd like to read this summer, etc. Visit the dollar store and stock up on post its. Encourage your kids to use them for reminders and messages for family members. Maybe a message to mom to get some more popsicles at the grocery store, a note to dad wishing him a good day at work, or a reminder to clean up the play room tomorrow. Have your kids keep a journal of their daily activities. If you have a little girl, she'd probably love a diary with a "lock" on it and it would probably encourage her to write about her summer days. Or bring a journal along on vacation so that your kids can write about their trip, the places they visited, and the observations they made. Before playing a game, have your child write down the step by step directions. Follow them and see how accurate they were. You could do the same with recipes before making lunch or even how to get somewhere in the community. Do you have any other ideas? Leave a comment and share them with me! 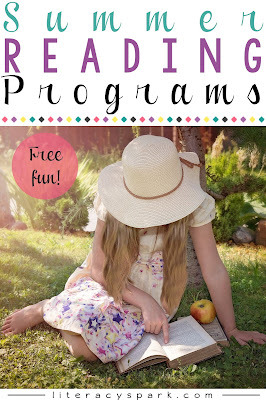 Each spring, I usually post the summer reading programs offered by local retailers on my blog (Literacy Spark). I decided to share them over here for Adventures in Literacy Land readers this time. I like to print the actual calendars for students and put them in a folder that I give them on the last day of school with their report card and other things. 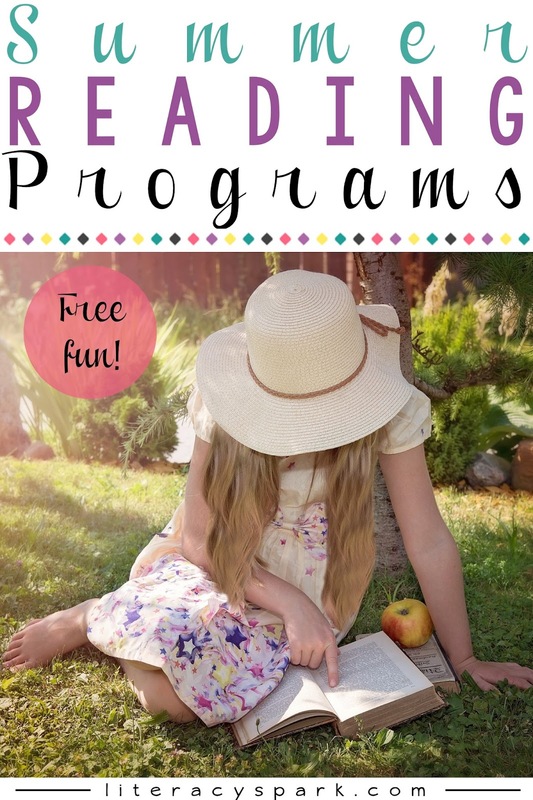 First, make sure to check with your local public libraries and see what programs they will be offering for kids throughout the summer. Often, the librarians will be willing to come into the school and speak to students before summer starts. 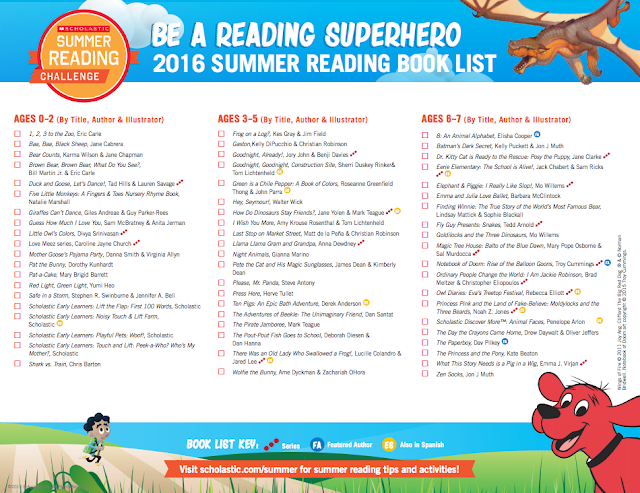 Many libraries hold summer reading challenges as well as special events and story times. 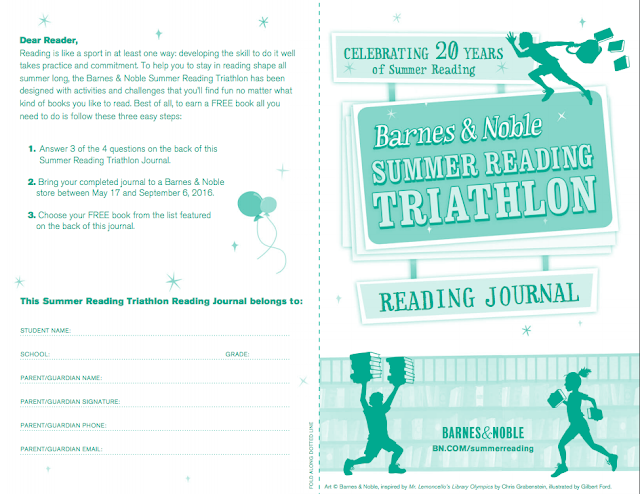 Barnes and Noble is having its usual summer reading program which rewards students with a free book upon completion of a simple reading journal. Stores will be holding opening ceremony events on June 4th. Find more information here. Chuck E. Cheese has a bunch of reward calendars on its website available for use any time of the year. One of them is for reading. 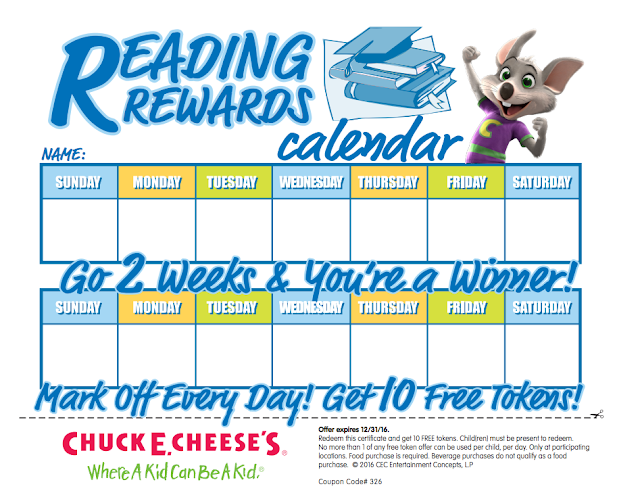 Kids can bring in a completed reading calendar and get ten free tokens. Calendars are available here. 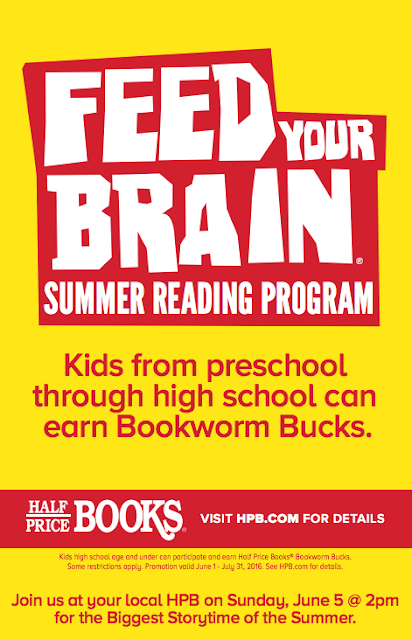 Half Price books is offering a $5 gift card with the completion of a reading calendar for the months of June and/or July. The calendar can be found here. 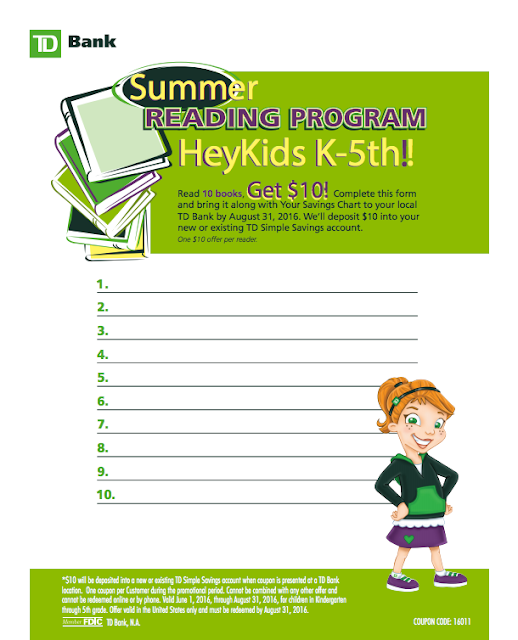 Kids that read ten books can get $10 added to their TD Bank account. More information can be found here. 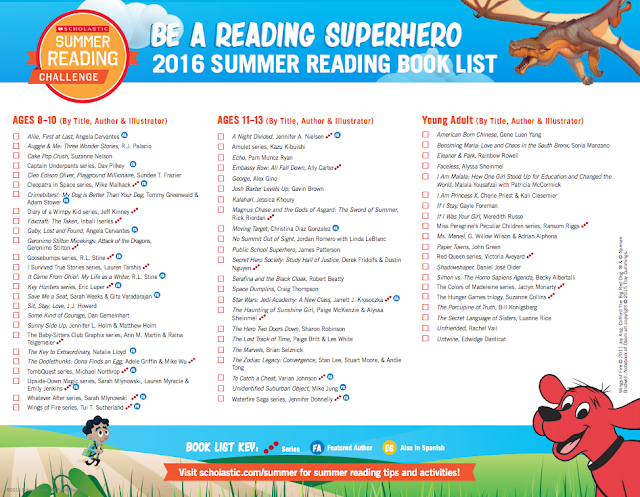 Scholastic is also hosting its summer reading challenge. 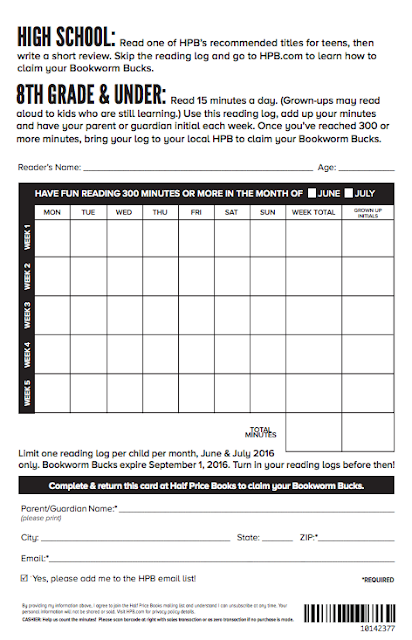 Schools, teachers, and/or parents can sign their children up to record the number of minutes read over the summer. There are a lot of resources on the site that are great including rewards and things of that nature, but my favorite are the book lists by ages. These would be great to send home with your students. They can be really helpful for parents who aren't sure what their kids should be reading. The resources from Scholastic can be found here. Sadly, I feel like I find fewer and fewer programs each year! So if you know of any others, please leave a comment and I'd be happy to add them to this list. Most of the classrooms at my last school were down side hallways. But the music class was in the main hallway on the way to the cafeteria and gym so we walked by it at least four times a day. Since the teacher’s door opened outward into the hallway, she had some tape on the floor and a cone placed where the door opened so that students would walk around it and she wouldn’t have to worry about anyone being hit with it. Without fail, every day at least one of my students (all of them at the beginning of the year!) would walk right through the taped off area, over the cone, or behind the cone. I started telling them to make an inference. Why was the tape there? Why was the cone there? Look at the door...which way does it open? Eventually most of them picked up on it but it become a running joke that whenever anyone ignored the tape or cone, my students would tell them to make an inference. I did things like this with my students ALL THE TIME. Working with English Language Learners, I knew it was important for my students to understand the meaning of the academic vocabulary they were being taught in class. What better way to do this than to teach it in fun, real life situations? My students totally knew what it meant to make an inference...use the clues and what you know to FIGURE IT OUT! It's raining outside. What will you be doing during recess? The teacher next door just brought in a kid with a paper and sat him in the back of you classroom. Why? Part of the playground is marked off with yellow tape. What does this mean? You walk into music class and you don't see a teacher who is not your normal teacher. Where is the music teacher? The principal just walked in your room with three other people dressed in suits and talking very seriously. What should you do? Your only pencil broke, you can't sharpen pencils in the middle of the day, and the pencil jar is empty. How can you get another pencil to use? A parent walks into your classroom with balloons and cupcakes. What is going on? Extra students from Mrs. Smith's class joined your class for the day. Why? You arrive at the cafeteria and the doors are still locked. Why? The entrance to the bathroom is blocked off with cones. What does this mean? You walk by Mr. Hark's classroom and see his kids yelling loudly. You see someone who is not Mr. Hark at the front of the room. What inference can you make? Another teacher picked your class up from recess. Why? Your teacher tells the kids in your reading group that they have to share books. Why would this be? A boy is sitting alone on a bench at recess time. What should you do? Your teacher is sitting at her desk with her hand on her head. What can you infer? You walk into gym class and no one is there. You see other classes heading out to the playground. What can you infer? Your principal always does the announcements, but today they were done by the secretary. Why might this be? The list goes on and on! 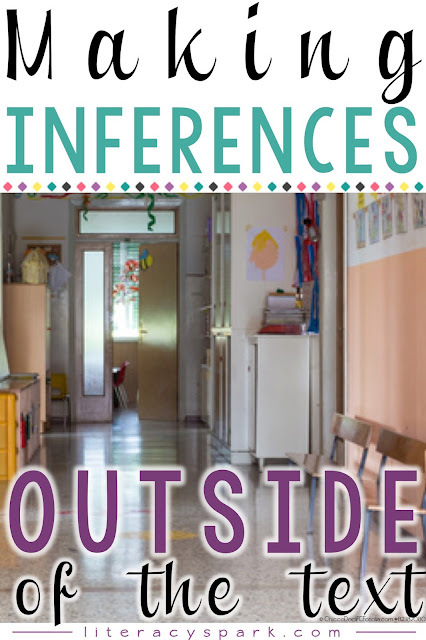 There are SO MANY times during the day that our students make inferences without even realizing it. Take advantage of these opportunities to teach the academic vocabulary that goes along with making inferences. This will make the task so much easier for students when working with text. 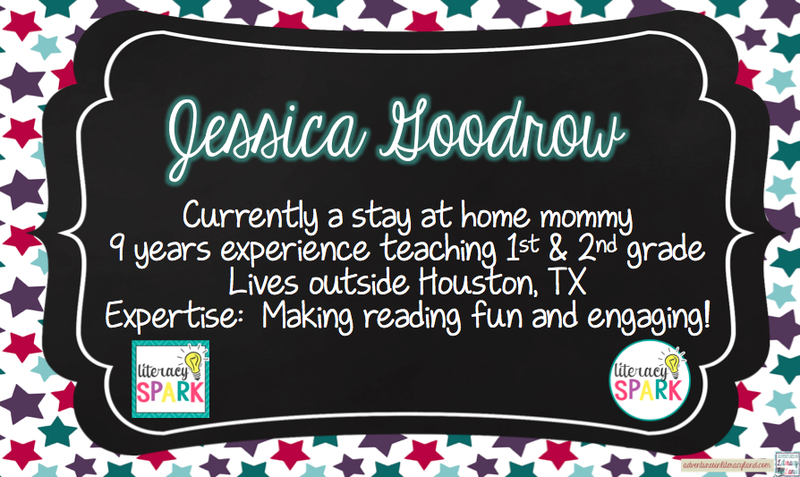 Hi, this is Jessica from Literacy Spark. If there is one thing I have learned teaching young students, it's that reading needs to be fun! If reading is a forced chore for a child in first grade, it will likely remain that way for years to come unless an awesome teacher comes along and makes an impact. 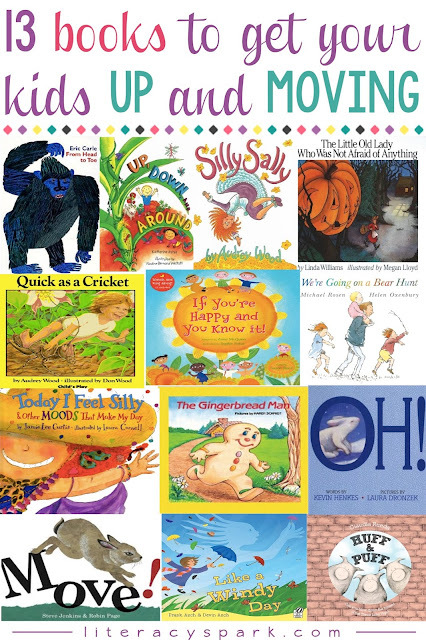 One of the ways to make reading engaging for young readers is to use books that encourage movement. 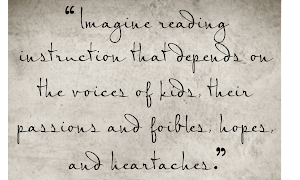 This makes reading books a desirable activity because it is fun! It's that simple. I am going to share with you today 13 books that you can use to get your students up and moving. The majority of them are most appropriate for pre-k, kinder, and first. Many also incorporate rhyming and repetitive text. Note: This post contains affiliate links. Click the book images or links to find the them on Amazon. 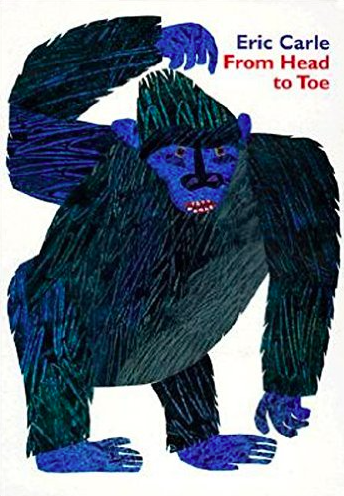 From Head to Toe by Eric Carle is a favorite in our house! My daughter is only 15 months old and she has learned the movements of the animals from this book. She even opens it up and does what the animals are doing all by herself. And now if she sees or hears "gorilla" she pats her chest. Amazes me! I used to have a big book of it when I taught first grade and it is really fun book for early readers. It's very repetitive ("Can you do it? I can do it! I can do it!") and on every page a movement is encouraged, for example, turning your head like a penguin or stomping like an elephant. 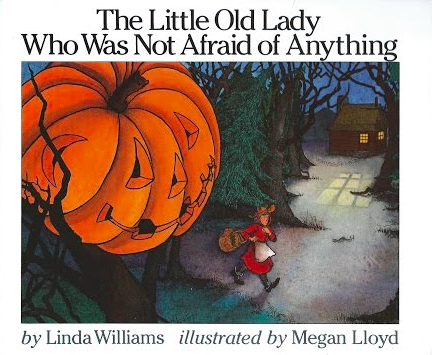 The Little Old Lady Who Was Not Afraid of Anything by Linda Williams is a classic and Halloween favorite. The little old lady is walking outside late at night when she starts being chased by shoes, pants, gloves, etc. Each of the items chasing her makes a special sound or motion (the gloves clap, for example). This book would be great for working on sequencing with little ones as well as problem and solution. 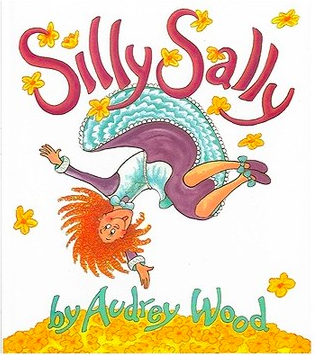 Silly Sally by Audrey Wood is silly book about dancing, leaping, tickling, walking backwards, and more. While not much depth, it does rhyme and have repetitive phrases so it would be good for fluency practice. 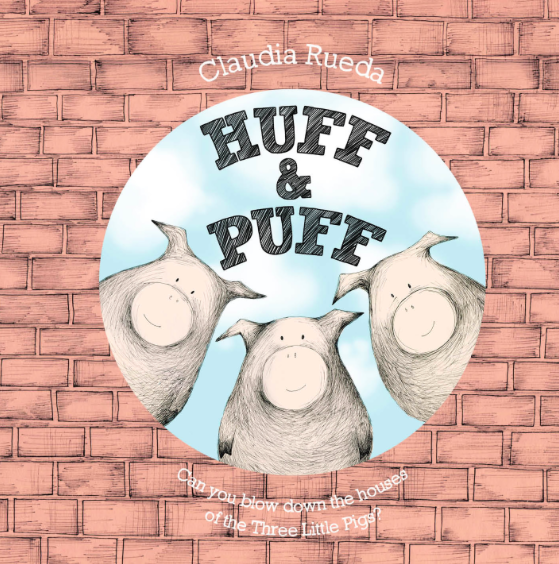 Huff and Puff by Claudia Rueda is a very simplistic take on The Three Little Pigs with a surprise ending. There is not a lot of text and the pictures allow for kids to tell and interact with the story themselves. The book itself has holes in it so that the reader can pretend to "blow" down the houses like the wolf. In Oh! by Kevin Henkes, the animals all want to come out and play after a snowfall. Each page has a different motion being performed by an animal so this would be a great book to use for teaching action words to young readers. 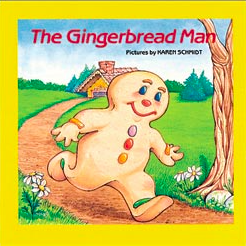 There is something about The Gingerbread Man that makes me (and my students) feel like running! 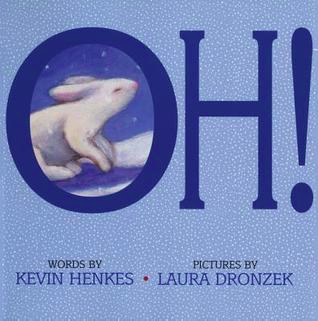 Kids into second grade still love this story! I've had second graders work together to put this into a play. Since the text is repetitive, it's easy for them to remember and they absolutely love running around and role playing it. This is still my favorite version. 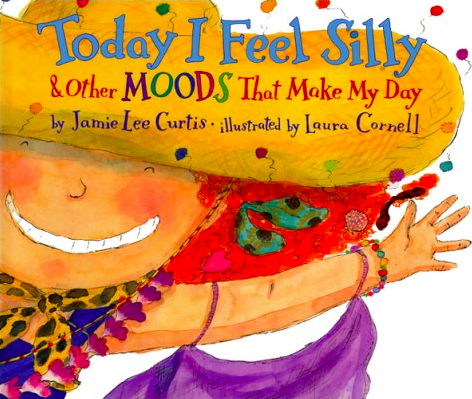 Today I Feel Silly by Jamie Lee Curtis is a really cute book all about feelings. It also rhymes and reads to a rhythm. Kids love acting out the different emotions shown in the text. Great for helping students learn to express their emotions using words other than happy and sad. 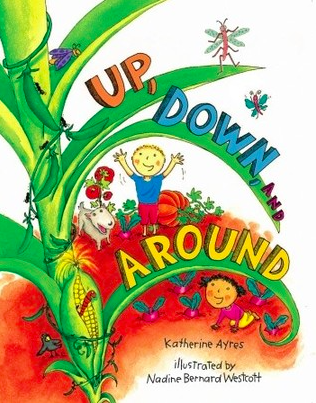 Up, Down, and Around by Katherine Ayres describes how some plants grow up, others grown down into the ground, while others grow around so it would work perfectly for a science lesson with young students. The text is simple and rhymes making it fun to read while learning how plants grow. All kids know this song, right? I mean I listen to it in the car every day now... I bet your students would be surprised to know that it is a book and I bet they would also find it very fun and easy to read! If You're Happy and You Know It! 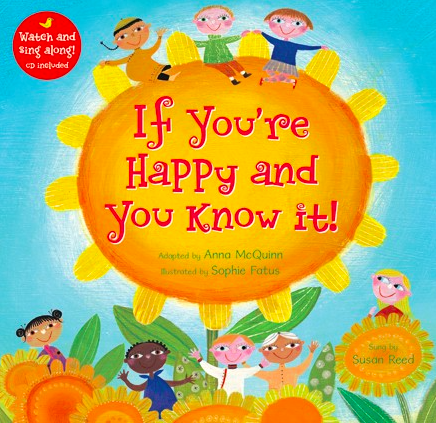 adapted by Anna McQuinn has colorful illustrations of children around the world and also comes with the music CD. 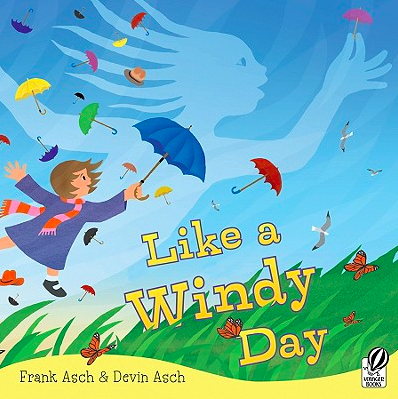 Like a Windy Day by Frank & Devin Asch would be an excellent book to use for visualizing. The little girl in the story basically imagines that she is the wind. It has fairly decent descriptive language for young readers too ("zoom down the hillsides") that they would have fun trying to replicate. 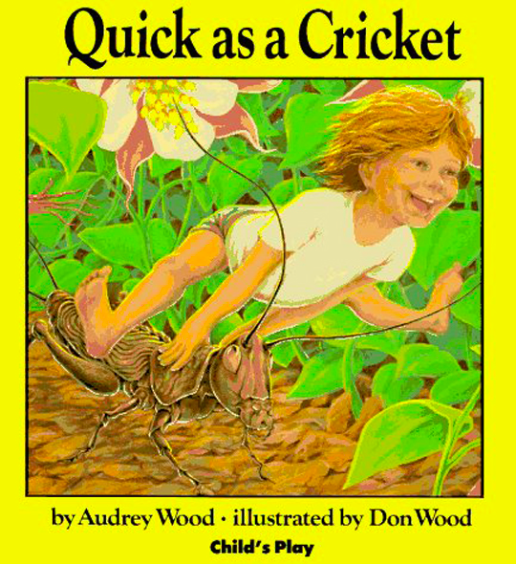 Quick as a Cricket by Audrey Wood has simple sentences that describe a boy pretending to be certain characteristics of animals, such as "I am as small as an ant." This text would be a good model for having students write their own similar sentences. Move! 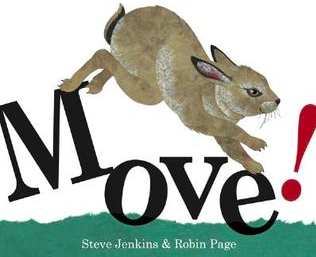 by Steve Jenkins and Robin Page would be a another book to use for teaching about action words or even for science as it specifically describes how different animals move. Kids love trying to act out the motions, which are pulled out of the text and written in large print on each page. 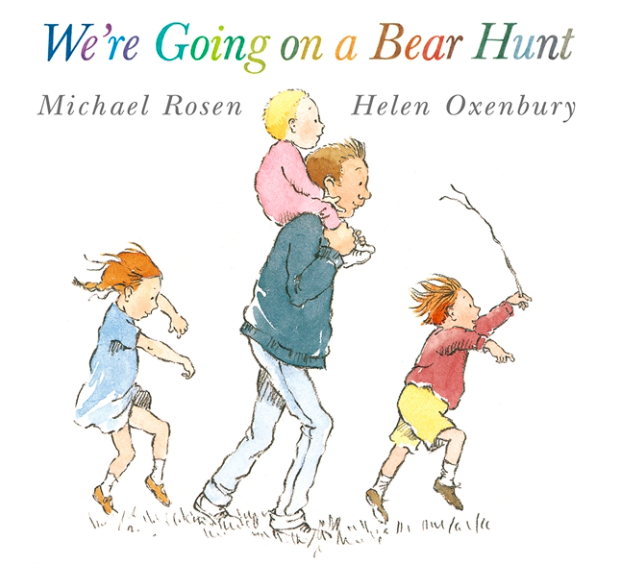 We're Going on a Bear Hunt by Michael Rosen brings the famous song to text. I'm actually not sure which came first since I never knew this was a book! Kids love singing along to the rhythm and patting their knees while they role play the actions. Here's a good You Tube video with the song and photographs to go along with it. I hope you have found something new to use with your students or even your toddler at home. 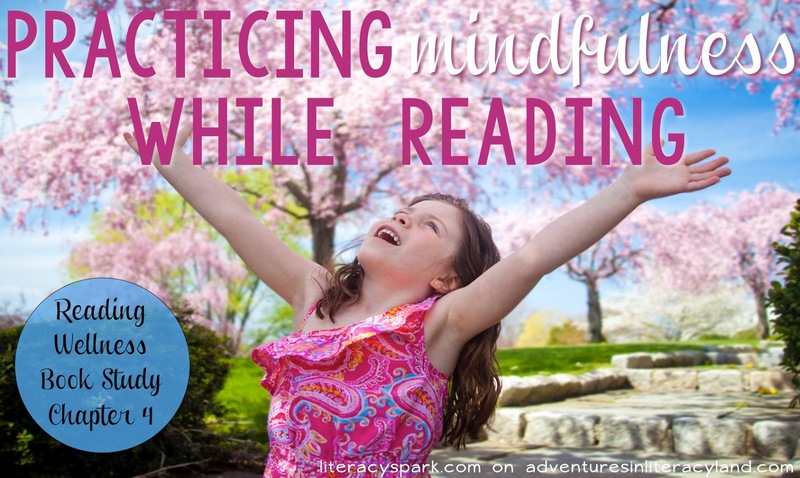 Just remember to let them move and have fun reading! 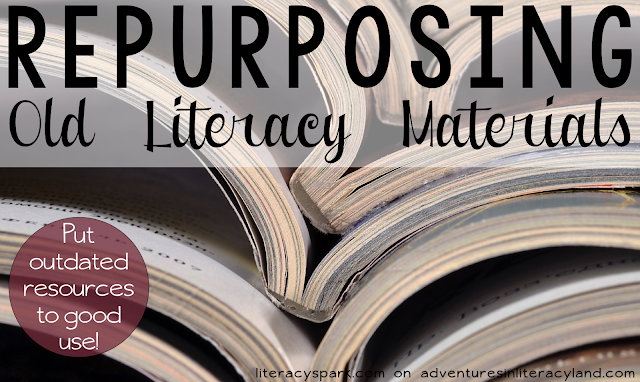 Follow Literacy Spark's board Student Motivation on Pinterest. If you are looking for other ways to motivate your students, follow my Pinterest board above. Hi there! 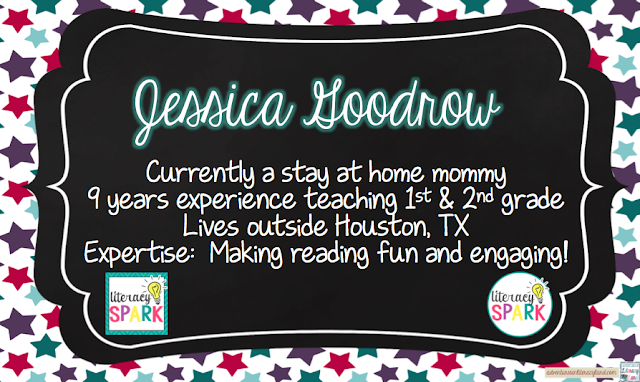 This is Jessica from Literacy Spark. 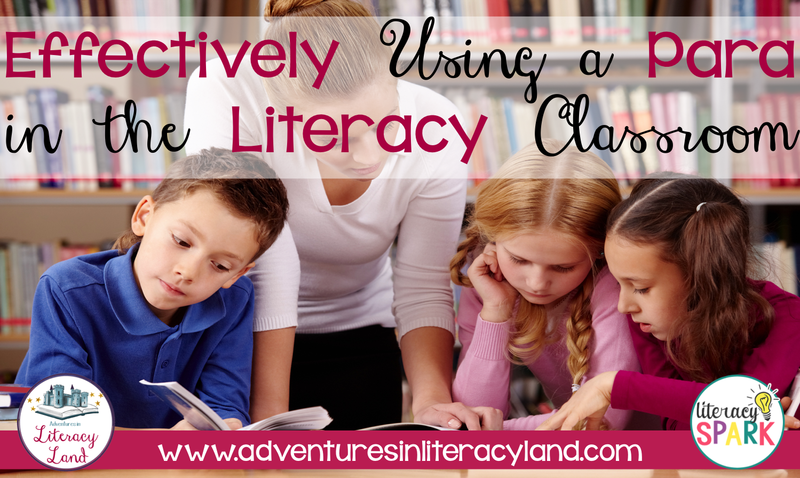 I am so excited to have joined Adventures in Literacy Land as a blogger this year. The blog is celebrating it's second birthday and this month will be spent introducing you to our bloggers, both old and new. Make sure to check back in to get reacquainted as well as to pick up some tips and freebies. There will also be a large birthday giveaway at the end of the month! So here's a little bit about me...I've been teaching for nine years. All of this has been in first and second grade. The first five years I taught in Connecticut and the last four were in Texas (where I live now). Two. Different. Worlds. 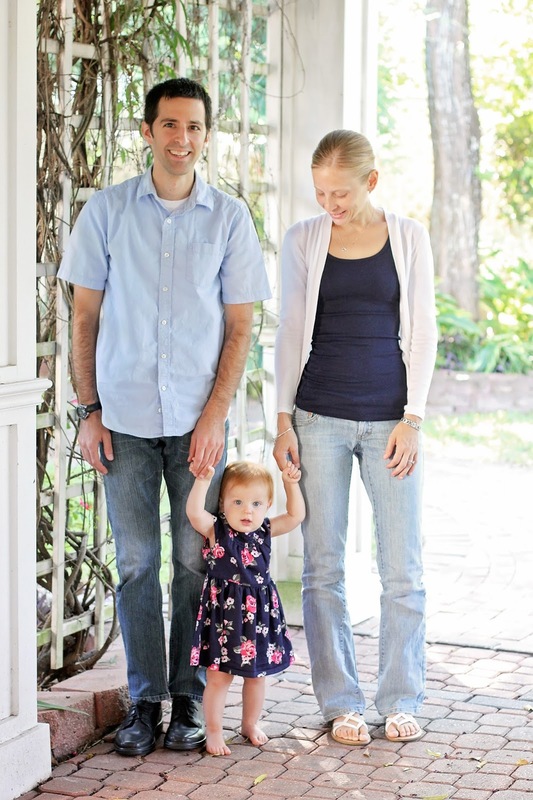 A little over a year ago, I had my daughter Gracie and we also moved about 45 minutes north of Houston. So, I left the classroom and am a stay at home mom for the time being. But JUST before getting pregnant, I had completed my master's degree in reading and language arts and received my reading specialist and master reading teacher certificates. So...kind of sad they aren't getting use...but future dream when I go back to work is to be a reading specialist or literacy coach. Because my first job was in first grade (and in the inner city with English Language Learners), I had to learn how to teach reading really fast! Well, it didn't happen that fast as I clearly had no clue when I started...but I got there and it really turned into my passion. 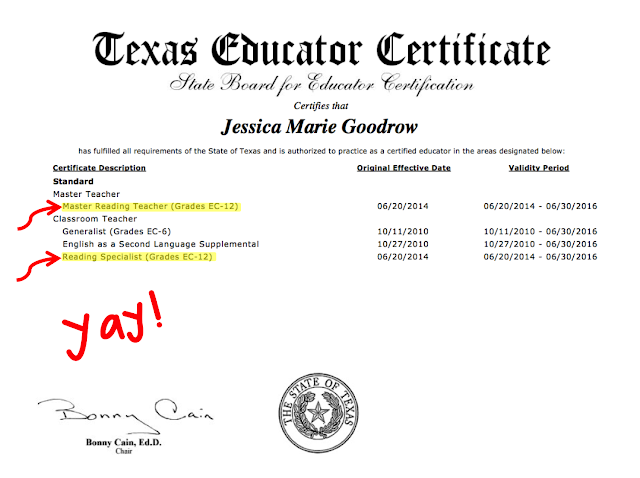 When I moved to Texas, I taught second grade and entered a district without reading specialists or coaches (who had really taught me so much at my previous job). There wasn't even a guided reading library...yep, no books!?!? And I was in a state obsessed with grading and testing. It was a challenge. But I was determined to still teach my students to READ (rather than how to take tests), keep the FUN in learning, and try to convince some of the rest of the staff to join me. I look forward to blogging this year and bringing you the perspective of a classroom teacher but with the eye of a reading specialist. I get it, really...the grades, the testing, the paperwork, the behavior, lack of materials, no interventionists...but we can still do the best we can! We are supposed to be blogging about our "speciality" but I sort of feel like I'm in the middle of everything and nothing at the same time right now. So for now I'm going to say my speciality is getting kids engaged, motivated, up and moving, and having fun while still learning concrete skills and strategies. 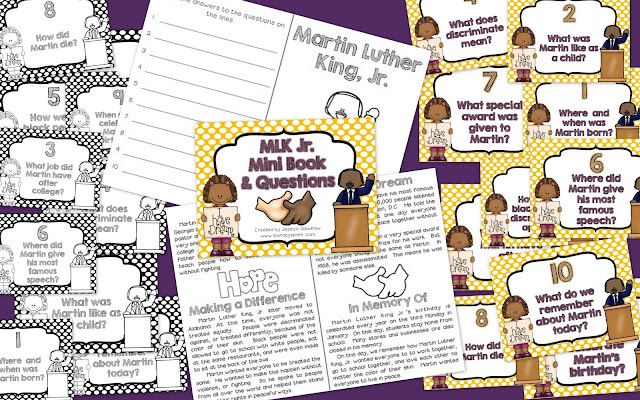 Since Monday is Martin Luther King, Jr. Day, I've got a related freebie for you. 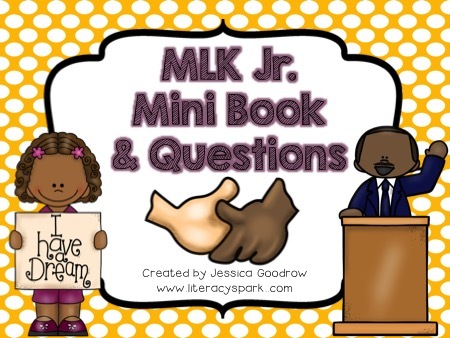 It's a little mini reader with ten right there factual questions. Seems simple, but it really is a challenge to get young readers to actually go back and find the answers. So this just reinforces the skill in a fun way. The questions are on full sheets of paper for you to put around the room in a scavenger hunt format to get your kids up and moving around. Trust me, it makes everything a lot more fun. Just post the ten questions somewhere around the room. Read the book together, in partners, small group...whatever works. Then have the kids get up with their books and go around hunting for the questions. 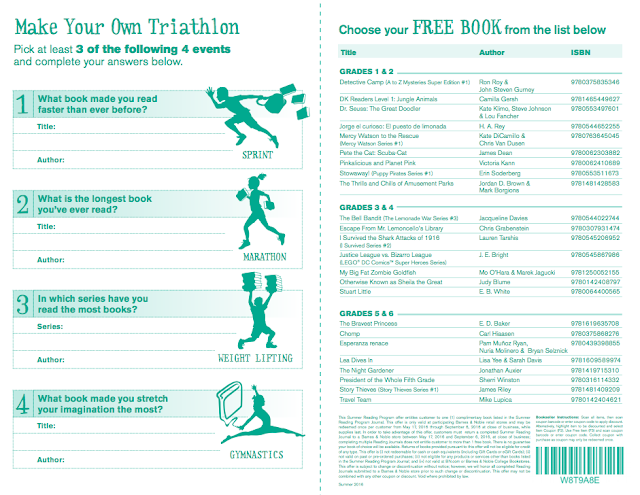 As they find the questions, they should refer to the little text for the answers, and record them next to the appropriate number on the back of the book. Easy to prep, fun, reinforces a skill, and teaches some content! You can grab it from my TpT store here.